We are Ochsner physicians within the department of Anesthesia, dedicated to caring for your child in their time of need. We know that when your child is sick, there’s an added level of anxiety not only for them, but for you as well. Our goal and mission is to get you and your family through one of the most stressful times in the hospital: before, during, and immediately after a diagnostic test, procedure, or surgery. Safety for your child under anesthesia is our most important concern, and at the same time we strive to make the experience as comfortable and understandable as possible. How will having anesthesia affect the development of my kid? We get this question more and more often, and the potential effects of anesthesia on young children has been the subject of intensive research the past five years. Here, we answer some of your most frequent questions. Is it harmful for infants and young children to undergo anesthesia? The early research in animals has raised concerns about some anesthetic drugs for infants and children under four years. However, this research is very limited and is not yet conclusive. Dangers to infants and children from anesthesia are unproven at this point. There is no direct evidence that anesthetics are unsafe for children. Are there alternatives to general anesthesia for surgery in young children? For most surgical procedures there are no realistic alternatives to the medications used for general anesthesia. What are the most common conditions requiring surgery for these kids? The most common procedures required for young children include ear tubes for chronic ear infection, tonsil removal, hernia repair, and circumcision. Should we postpone surgical procedures that require anesthesia for infants and young children? Children do not undergo surgical procedures that require anesthesia unless the surgery is essential to their health. Therefore, postponing a necessary procedure may itself cause problems and would not be an option for the majority of children. Studies which should provide real answers are underway, and results are due to come in from the end of 2015, to 2017. For more information, visit the SmartTots website. So your child needs a test, procedure, or operation. Our division of pediatric anesthesiologists specialize in the care of kids for every conceivable type of surgery. We’ll get to know you and your child, tailor a custom anesthesia plan to get them through it safely and comfortably, and be there every step of the way until they’ve recovered. Whether for a long MRI that your child has to hold still for, or a complex, invasive surgery, we’ll administer general anesthesia to make sure they feel no pain, and remember nothing about the actual procedure. Rest assured, the serious effects on heart, lungs, and brain this type of anesthesia has will be continually monitored and adjusted by our team at all times. Depending on the procedure, it may be possible to provide a spinal, epidural, or nerve block in addition to, or instead of general anesthesia. These techniques often provide superior pain control, less side effects, and a faster recovery. For the child with a complex heart condition, our team specializes in anesthesia for congenital heart surgeries, as well as cardiac catheterization procedures. We care for the littlest patients undergoing procedures both in the neonatal ICU, and in and out of both Baptist/Main Campus operating rooms. Sometimes your child just needs some mild/moderate sedation to get through a test, or may have pain that is not well-controlled by standard means. We are the hospital’s go-to team for these situations! Needing surgery is stressful enough, but when it’s your child that’s getting operated on, the concerns and questions can be overwhelming. Parents often find that the most anxiety-provoking part of the procedure is in fact the anesthesia! You’ll get a surgery date from your surgeon’s office, with written information about when and where to arrive. One of our nurses will call to go over all this information with you personally. There will be some restrictions about the last drink and meal your child can have prior to surgery– this is for the safety of your child while undergoing anesthesia. After check in, you’ll be escorted to the preparation area, where your child will be weighed, blood pressure etc.. measured, and you’ll meet your anesthesia team, surgery team, and operating room nurses. A specialist from Ochsner’s Child Life division will be on hand to distract and comfort your child, providing a tutorial on anesthesia (when appropriate), games, balloons, etc. Depending on your child’s age, he or she will be given a liquid medication that will make him or her very relaxed while waiting for surgery. Most of the time, your child can go to sleep before their IV is started. Your anesthesia team will take your child to the operating room to go to sleep, while you exit to the waiting area. Your child will be directly monitored at all times and cared for by the anesthesia team. Once surgery is finished and your child is awoken and moved to the recovery room, your surgeon, anesthesiologist, or nurse will come out to the waiting area, and reunite you with your child while they recover from anesthesia. Children are often very confused when they come out of anesthesia and may be sleepy or quite wild. This usually resolves within an hour, after which you’ll be free to take them home! One of our nurses will call you the following day, just to see how things are going. The anesthesia will be completely gone from your child 24 hours after surgery. You’ll be scheduled for a follow-up visit with your surgeon. 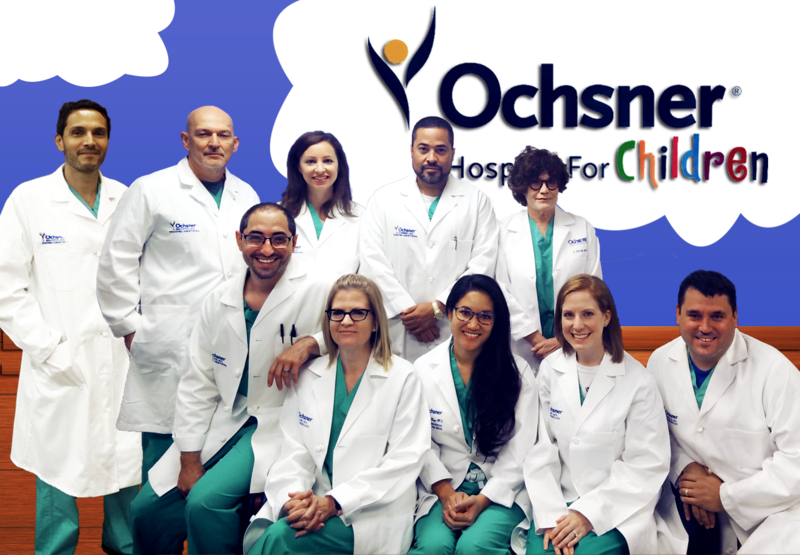 The Ochsner Pediatric Anesthesiology team is dedicated to caring for your child in their time of need. Our team of physicians are board-certified (or equivalent) in both adult and pediatric anesthesiology, and collaborate closely with nursing and Child Life Specialists at the Ochsner Hospital for Children.